Polyurethane coatings offer excellent optical properties, such as high gloss and brilliance. Polyurethanes (PUR) are reaction products of polyisocyanate curing agents with several polymers, e.g. with polycarbonates. Especially Polyurethane-based two-component coatings are very solid, offer good resistance to aggressive chemicals, weathering, and mechanical stress. For the first time, Ceresana examined the global market for PUR paints and coatings in detail: The market research institute forecasts revenues generated with these products to rise to approx. USD 20.3 billion until 2025. The most important application areas for PUR paints and coatings are furniture and wood processing, transportation, and other industries. In 2017, approx. 53 % of global demand was registered in Asia-Pacific, followed by North America and Western Europe. The most important sales market for PUR paints and coatings in 2017 was the segment wood processing / furniture with a share of 37.0% of total global demand. Color, structure, and pore formation of the wood are properties, which should be retained or reinforced during coating. Two-component PUR systems are highly reactive, can be sanded quickly, are resistant to household chemicals, have a good filling power, improve grain contrasts, and provide mechanical stability. Demand for PUR coatings for vehicles (OEM and refinishing) accounted for more than 28% of the global market in 2017. Series painting (OEM coatings) can be divided into the stages cathodic electrodeposition, car underbody protection and application of primer surfacers, basecoat, and clearcoat. The electrodeposition coating protects from corrosion, primer surfacers provide an even foundation, the basecoat provides color and effect, and the clearcoat offers chemical and scratch resistance. Refinishing coatings is used in case of damages, for used cars as well as for special coating for new vehicles. Of all application areas of PUR coatings, the segment transportation (OEM) will account for the highest growth in percentages until 2025 at rates of 3.9% per year. Ceresana expects the construction segment to increase its demand for PUR coatings by 2.6% per year. This downstream market is decisively affected by residential construction, commercial construction, and projects regarding infrastructure construction. 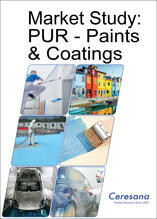 PUR coatings are also utilized for particular products, e.g. façade elements, doors, window profiles, and gutters besides protection of buildings and bridges. Demand for PUR coatings in the industrial sector amounted to about 325,000 tonnes in 2017. Protection coatings for industrial facilities and machines account for the major share within this application area: Aggressive conditions prevail during oil production, petrochemical processing, and energy generation in particular. Commonly, a long durability of the paints and coatings is desirable to prolong service intervals. The group of other applications is the smallest segment: This category comprises all special applications of paints and coatings, e.g. the use for electrical and electronic devices, packaging, sports equipment, toys, medical products, and textiles. Chapter 1 provides a depiction of the global market for paints and coatings based on polyurethane – including forecasts up to 2025: Data on demand and revenues are analyzed for the regions Western Europe, Eastern Europe, North America, South America, Asia-Pacific, the Middle East, and Africa. Chapter 2 provides market data for the 16 most important countries, that is, country-specific information on demand and revenues. Furthermore, demand is split by application areas. Chapter 3 analyzes the regional markets for paints and coatings: Data and factors influencing demand in the segments transportation (OEM, refinish), construction, wood processing / furniture, industry, and others. Chapter 4 provides profiles of the largest manufacturers of PUR paints and coatings – clearly arranged according to contact details, turnover, profit, product range, production sites, and profile summary. Extensive profiles of 106 producers are given, including Akzo Nobel N.V., ALTANA AG, Asian Paints Ltd., Kansai Paint Co.,Ltd., KCC CORP., Nippon Paint Co., Ltd., PPG Industries, Sika AG, RPM International Inc., and The Sherwin-Williams Company.